UNIX systems crash. It's a fact of life. Until now, little information has been available regarding system crashes. Panic! is the first book to concentrate solely on system crashes and hangs, explaining what triggers them and what to do when they occur. Panic! guides you through system crash dump postmortem analysis towards problem resolution. 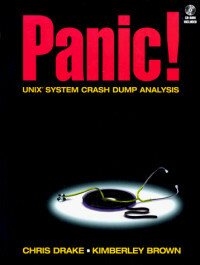 Analysis of system crash dumps usually requires the skills and resources of a UNIX guru,including a wide set of programming skills, an indepth knowledge of UNIX internals, and access to source code. However, by following the advice and "tricks of the trade" presented in Panic!, you will be able to establish what killed your system.